Astron Limited is involved in the mining of rare earth minerals and has mines and facilities in both Australia and China. The rare earth minerals are extracted from mineral sands, one of the biggest metals they extract is zirconium. Most investors might not be aware of what a rare earth mineral is, but anyone reading this is using hardware that is assembled out of them. Rare earth minerals are used in iPads, cell phones, computers, aerospace components, lasers and batteries among other things. The rare earth mining sector was in the news recently when China announced that it was limiting export of rare earth elements causing a bit of a squeeze on the market. What's interesting about the rare earth mining business is that the actual elements are not all that rare, it's just that mining them is very costly. Most rare earth mines in the US closed years ago before demand ramped up, news has been floating around that some of the old mines might be reopened. Astron operates two main locations, they have the Donald Mineral Sands project, and a project to produce titanium dioxide in Shenyang China. The Donald sands is both a mineral extraction site, and a processing plant. The China location is a processing plant only. The company operates out of China, and built up the largest zirconium chemical business in the world. A few years ago the company sold it's China extraction site which is the source of it's cash on the balance sheet. -The company states they have AU$2.85 in tangible assets per share, and AU$3.24 net assets per share. -Astron Ltd is profitable, net profit increased 92% in the latest half year report. -China is restricting rare earth exports, and Astron Ltd is already operating in China, giving them an advantage. An article in Mining Weekly discusses that demand is exploding while supply outside of China is nonexistant. 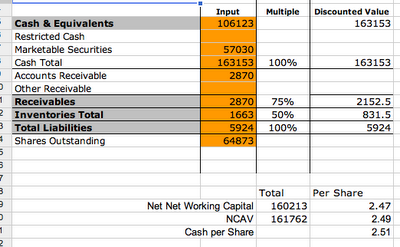 -Almost all of it's net current assets are in cash or short term investments earning interest. -At the current development run rate they have cash to last 13 years. -The company is debt free and is funding development from it's cash and investments. -Astron can be purchased for just slightly more than the cash at hand. 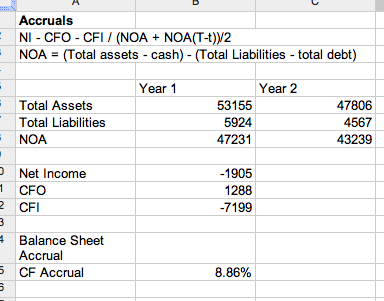 I did a workout for cash flow accruals and took into effect the loss due to currency translation. Looking at how much of the profit is accrual revenue vs cash helps determine the quality of earnings. Astron's accrual percentage is 8.86% which is about average. -There are a few risks to an investment in Astron, the first and biggest is they have stated they plan on using their cash to continue to develop their mining sites. This means there is little chance the cash will be distributed to shareholders as a dividend, or that the company will liquidate. -Astron operates out of China which adds an element of political risk to the investment. -The company is cash flow positive, yet is spending a considerable amount for investment, as of the last quarter they spent AU$5.64m on mine development and PP&E acquisition. -The commodity boom could come quickly to an end and demand for the metals could wear off leaving Astron with a hefty investment in a product no customers. -The company is small, with a market cap of AU$168m there is not much visibility. -The company is listed on the ASX but has most of it's operations in China, this creates a confusing situation for potential investors. -The market seems unsure about the development potential for the Donald Mineral Sands. -While the company is cash flow positive and profitable they are burning considerable cash to develop the new sands. Disclosure: I don't own any of the issues mentioned in this post.